VISIT CONTINENTALTIRE.COM FOR COMPLETE DETAILS. 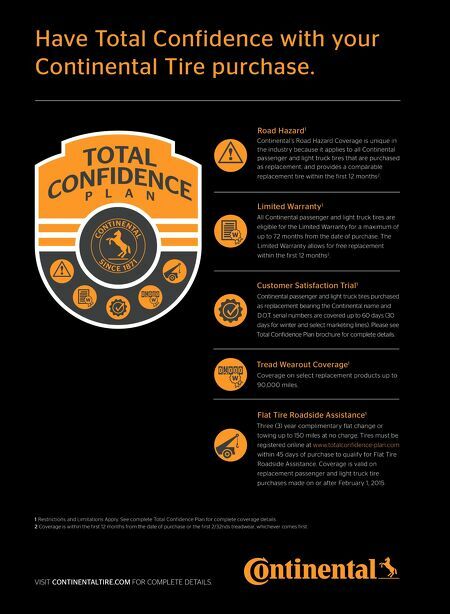 Have Total Confidence with your Continental Tire purchase. 1 Restrictions and Limitations Apply. See complete Total Confidence Plan for complete coverage details. 2 Coverage is within the first 12 months from the date of purchase or the first 2/32nds treadwear, whichever comes first. Road Hazard 1 Continental's Road Hazard Coverage is unique in the industry because it applies to all Continental passenger and light truck tires that are purchased as replacement, and provides a comparable replacement tire within the first 12 months 2 . Limited Warranty 1 All Continental passenger and light truck tires are eligible for the Limited Warranty for a maximum of up to 72 months from the date of purchase. The Limited Warranty allows for free replacement within the first 12 months 2 . Customer Satisfaction Trial 1 Continental passenger and light truck tires purchased as replacement bearing the Continental name and D.O.T. 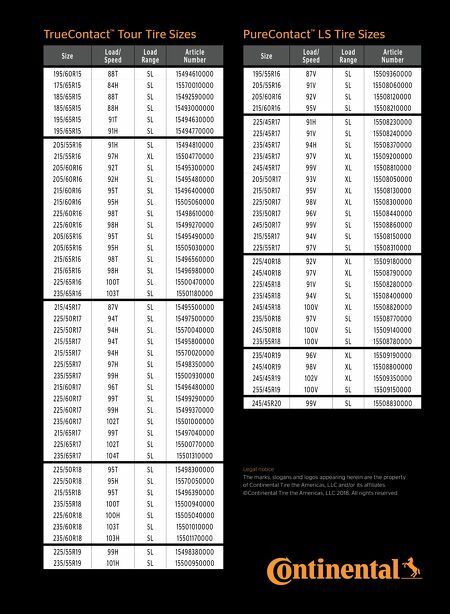 serial numbers are covered up to 60 days (30 days for winter and select marketing lines). Please see Total Confidence Plan brochure for complete details. Tread Wearout Coverage 1 Coverage on select replacement products up to 90,000 miles. Flat Tire Roadside Assistance 1 Three (3) year complimentary flat change or towing up to 150 miles at no charge. Tires must be registered online at www.totalconfidence-plan.com within 45 days of purchase to qualify for Flat Tire Roadside Assistance. Coverage is valid on replacement passenger and light truck tire purchases made on or after February 1, 2015.